(Phys.org)—While Ashleigh Gonzales is a typical, 20-year old ASU senior, she is not your average student. Unlike other undergraduates studying life sciences, her decision to major in molecular biosciences and biotechnology created an unusual challenge – one few others are willing to tackle. "When I applied to Arizona State University, I chose molecular biosciences and biotechnology because of my love of biology," said Gonzales. "I was always very interested in science. From a high school biotechnology course, I found that although I loved biology, it was the finer details, such as the molecular processes involved, that I was most interested in." As part of the course, students must design and execute a research project as well as give a final presentation to classmates and bioimaging faculty. Gonzales' project described how 2-D images could be converted into 3-D tactile boards. They, in turn, provide students who are blind or visually impaired an opportunity to independently learn about images found in textbooks, presentations and captured through a microscope. "I chose this project because I feel very strongly about the potential for the blind population to have access to STEM materials," Gonzales said. "Right now, very few blind people will pursue a career in a STEM field. There is a whole group of people whose only barrier to STEM fields might be easier to break than previously believed." 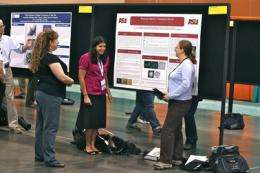 Recently, Gonzales and classmate Leanne Harris presented their scientific poster, titled "Pictures Worth a Thousand Words," at the national Microscopy & Microanalysis meeting in Phoenix. "Ashleigh was the lead author on this poster and presented her research to a group of outstanding microscopists from around the world," said Debra Baluch, research scientist in School of Life Sciences. "We were excited to see the positive response from fellow microscopists as our student who is blind, explained to them how to look at image data in a different way." "Our poster presentation was very successful," said Gonzales. "Several people showed an enthusiastic interest in our project. People inquired as to how the tactile boards are made, and provided suggestions on how they might be used. Our research stimulated a lot of conversation about the potential for blind people to have better access to STEM fields." Gonzales and Harris both received NASA/ASU Grant Internships to continue researching cell biology and developing three-dimensional tactile image technology. The pair will receive assistance from an interdisciplinary research team from ASU's School of Life Sciences, School of Earth & Space Exploration, Ira A. Fulton Schools of Engineering, and Disability Resource Center. In addition, Gonzales will continue her leadership role for a second year as president of Ability Counts Tempe – a disability awareness group on ASU's Tempe campus. In an attempt to remove common stigmas, the group works to promote better understanding of people with disabilities.